Welcome to Monitor, the data acquisition and control newsletter. Thanks for subscribing and our complements of the season to you. If you wish to download our free data acquisition software please do so from https://www.windmill.co.uk/jsarrpsrr.htm. You can download this issue of Monitor as a pdf file from https://www.windmill.co.uk/monitor/monitor232.pdf. "I have been trying to get a comparator (Heidenhain ND1200 Quadra-Chek) to communicate with a computer and stumbled across your ComDebug software. I'm completely new to this, and if all I can do is get the data to output into something I can port to Excel, I'll be happy. Right now I'm not sure how to parse the data because the sections of data are broken up by "009" characters. If I try to parse up to the next "009", the program tries to look for a 0, 0, 9 string, not the single unit "009". Do you have any advice on this? Thanks immensely (because even if you can't help with this issue - your website/program has been quite helpful already)." Thanks for your question and kind words! To parse the 009 you need to use the NonPrint menu in the Reply Parser. You could first search for the "009" character. 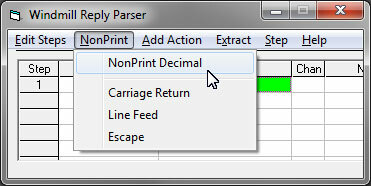 Choose Search as the Action then select NonPrint Decimal from the NonPrint menu. Type 009 into the box that appears. It will be shown as \C(009) in the Parameters column. The next action will occur after the 009 character, and so you could extract until the next 009 character if you wished. 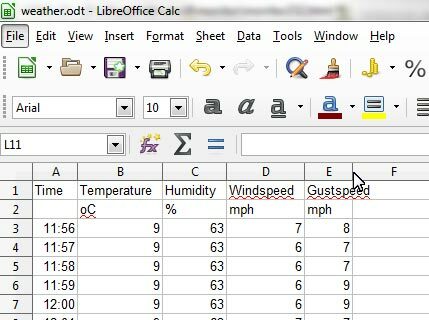 This tip applies to both Excel and Calc (OpenOffice and LibreOffice). To quickly automatically size the column to its contents just double-click the column separator next to the column letter. A simple but little-used trick. Current methods of baiting, hooking and filming sharks and other large fish are invasive, costly and require teams of scientists spending much time at sea. 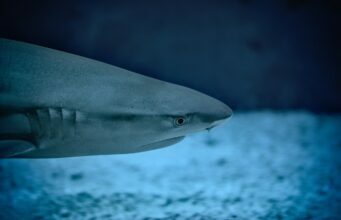 New study shows that a sample of seawater can provide the identifiable tracks of numerous species of shark. Researchers have developed an underwater acoustic system that locates marine mammals, underwater vehicles and other sound sources in the ocean, using no more than a single hydrophone as a receiver. Drone project is using photonics to detect toxic gases in the atmosphere following events such as wildfires, chemical explosions and volcanic eruptions. A road surface temperature sensor which provides real-time data on road conditions is set for adoption on the UK's road and motorway network. Asia's leading exhibition specialising in test, inspection, measurement and analysis for electronics manufacturing. International trade fair of analytical measurement and control. Design, automation and test exhibition. International industrial dimensional metrology conference. Biennial exhibition of the best innovations and latest developments in the manufacturing technologies sectors. Sensors, control, measuring instruments, SCADA, process control systems, environmental control, etc.